The Simms Men’s Rogue Fleece Fishing Hoody is a fleece fishing hoody for men made by Simms that is constructed with a 100 percent polyester woven face with a 100 percent polyester fleece backside that is bonded with a DWR finish. The comfortable, innovative and very well made fishing hoody also comes with a fly box compatible chest pocket with an internal cordport. If you are in the market for a quality, innovative and very comfortable men’s fishing hoody that is made with fleece fabric to help keep you nice and warm, then make sure to check out this Rogue fleece hoody. The Simms Men’s Rogue Fleece Fishing Hoody comes stocked with fleece backed hand warmer pockets to help keep your hands warm and snug while you are enjoying your fishing adventure while wearing this popular Simms fleece hoody. The Simms Men’s Rogue Fleece Hoody is also designed with a rib knit at the hem and cuffs that provides men anglers with added comfort. This Rogue Fleece Fishing Hoody is also constructed with a YKK Vislon center front zipper that is corrosion resistant and comes stocked with a three panel ergonomic hood to shield you from rough weather conditions while wearing this men’s fishing hoody. This Rogue fleece fishing hoody will surely keep you nice and warm in style as well as keep you very comfortable. The Rogue River begins at Boundary Springs on the border between Klamath and Douglas counties near the northern edge of Crater Lake National Park. Although it changes direction many times, it flows generally west for 215 miles (346 km) from the Cascade Range through the Rogue River – Siskiyou National Forest and the Klamath Mountains to the Pacific Ocean at Gold Beach. Communities along its course include Union Creek, Prospect, Trail, Shady Cove, Gold Hill, and Rogue River, all in Jackson County; Grants Pass, and Galice in Josephine County, and Agness, Wedderburn, and Gold Beach in Curry County. Significant tributaries include the South Fork Rogue River, Elk Creek, Bear Creek, the Applegate River, and the Illinois River. Arising at 5,320 feet (1,622 m) above sea level, the river loses more than 1 mile (1.6 km) in elevation by the time it reaches the Pacific. It was one of the original eight rivers named in the National Wild and Scenic Rivers Act of 1968, which included 84 miles (135 km) of the Rogue, from 7 miles (11.3 km) west of Grants Pass to 11 miles (18 km) east of the mouth at Gold Beach. In 1988, an additional 40 miles (64 km) of the Rogue between Crater Lake National Park and the unincorporated community of Prospect was named Wild and Scenic. Of the river's total length, 124 miles (200 km), about 58 percent is Wild and Scenic. The Rogue is one of only three rivers that start in or east of the Cascade Range in Oregon and reach the Pacific Ocean. The others are the Umpqua River and Klamath River. These three Southern Oregon rivers drain mountains south of the Willamette Valley. The Willamette River and its tributaries drain north along the Willamette Valley into the Columbia River,which starts in British Columbia rather than Oregon. This jacket is true to size. I bought this as a gift and he loved it. 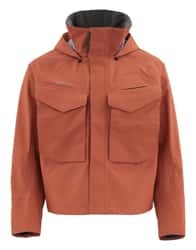 The Simms Rogue Fleece Hoody is a really great fly-fishing jacket. I love the camo color jacket, I even wear it when I'm not fishing because it's so comfortable and good looking. When I am fly-fishing, I appreciate the fact that it has pockets to store my fly box and it's not only very functional, but also extremely comfortable. 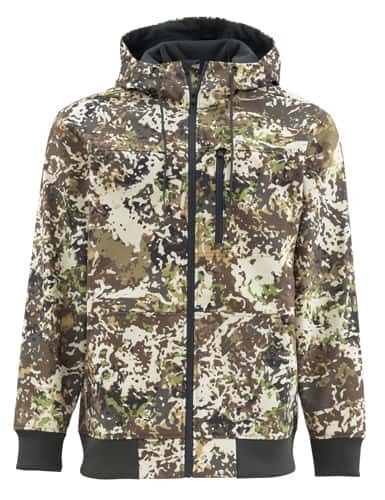 I would definitely recommend the Simms Rogue Fleece Hoody.